About this Virtual Run: In honor of Mother’s Day, this virtual run is dedicated to mothers everywhere. 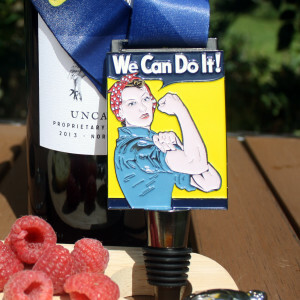 Whether you are a tough mother runner yourself or you want to run or walk in honor of one, all participants will receive a custom electronic race bib and this two sided ‘Rosie the Riveter’ wine stopper medal. Run or walk your 5k, 10k or half marathon whenever and wherever you want! About the Charity: There are more than two million children and teens in the United States grieving the deaths of their moms or dads. 1 in 20 children experience the death of a parent before the age of 16 – that’s one in every classroom, and two on every school bus. Family Lives On provides ongoing support tools to these children, who are at much greater risk for psychological and behavioral problems than their non-bereaved peers. The Foundation’s Tradition Program encourages the healthy emotional development of parentally-bereaved children and teens by providing annual opportunities for intentional remembering, creating a safe haven for grief, communication and celebration.